Fish oil -- a potent source of omega-3 fatty acids -- has achieved wide acclaim as having near panacea-like healing properties, reputed to prevent or improve many conditions, including heart disease, heart attacks, high blood pressure, menstrual pain, attention deficit-hyperactivity disorder, osteoporosis, atherosclerosis, kidney problems, depression, bipolar disorder, psychosis, endometrial cancer, psoriasis and more. Scientific research has supported many of the claims for fish oil and omega-3 fatty acids, as noted at the National Institutes of Health. Omega-3 fatty acids may even assist in weight loss when taken in the proper dosage. The three primary forms of omega-3 fatty acids are eicosapentaenoic acid, or EPA; docosahexaenoic acid or DHA and alpha-linolenic acid, referred to as ALA. EPA and DHA are long chain fatty acids that are easily utilized by your body. EPA and DHA are found in fish, algae extracts and fish oil supplements. ALA is a short chain fatty acid that must be converted by your body into a long chain fatty acid in order to be biologically useful. ALA can be found in flaxseed, flaxseed oil, canola and soybean oil, walnuts and in smaller quantities in green leafy vegetables such as spinach and broccoli. Plant sources of omega-3 provide less complete fatty acids. ALA sources such as flaxseed, walnuts or greens are primarily converted into EPA, leaving your body short of DHA, reports U.S. News. On the other hand, the fermentation process used to create algae-based supplements of omega-3 produce DHA but not EPA. Theoretically, you can take a combination of algae supplements and other ALA-based plant sources of omegas to get the proper balance of EPA and DHA. Fish oil contains both EPA and DHA. These omega-3 fatty acids can be obtained by eating cold water fish, such as halibut, salmon, herring, mackerel, sturgeon, bluefish, mullet, trout, anchovy, sardines and tuna. Each 3.5 ounce serving of fish provides an average of 1 gram of omega-3 fatty acids, according to National Institutes of Health. Studies that link weight loss to omega-3 fatty acids have focused chiefly on fish oil. Both human and animal studies suggest that the omega-3 acids in fish can assist with weight loss. Several studies from "The American Journal of Nutrition" and "International Journal of Obesity" suggest that 1.5 to 2 grams daily of fish oil can produce weight loss of a couple of pounds over a month or so. Studies, such as those described at "The American Journal of Nutrition," indicate that exercise and fish oil contribute independently to weight loss. Those who took fish oil and exercised lost more than those who just took fish oil or exercised. Fish oil appears to enhance weight loss, at least in part, by increasing fat metabolism. A study from the University of Georgia published in the "Journal of Nutrition" found that the DHA in fish oil prevents pre-fat cells from being converted into fat. Some studies of fish oil and weight loss, such as those published in "The American Journal of Nutrition" and "International Journal of Obesity," have used dosages from 1.5 to 2 grams of DHA/EPA. This amounts to four to five ounces of fish per day. Fish oil supplements tend to come in 30 percent concentration, one-gram capsules, meaning you would need to take four or five capsules per day to reach the 1.5 grams therapeutic threshold. 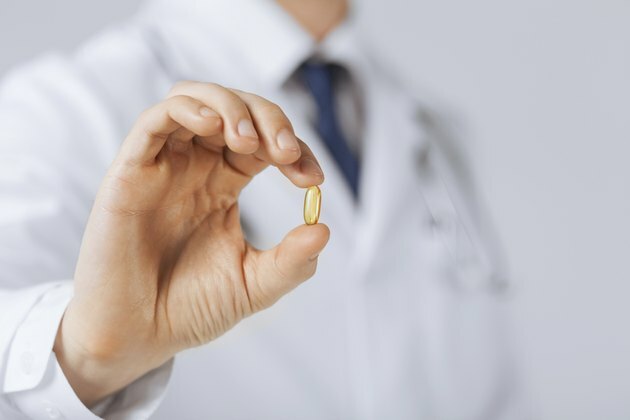 Before you abandon your diet and head toward the supplement aisle of your pharmacy, consider that the average weight loss in most fish oil studies amounts to just a couple of pounds. Still, any help in the battle of the bulge is appreciated. The many documented benefits of fish oil alone justify taking it for health reasons. Consult with your physician before significant changes in your diet or supplement usage. The National Institutes of Health cautions that three or more grams daily of EPA and DHA may cause excessive bleeding in some people and taking excessive doses of fish oil may increase the risk of stroke. Does Fish Oil Help You Lose Belly Fat?